Alongside the electrics and plumbing we offer a range of other skills all of which have been put into practice whilst sympathetically updating our own Victorian home. Plumbing (NVQ II): we are experienced in kitchen sink and tap replacement, appliance connections, outside taps, radiator moving and replacement, and cloakroom / bathroom installations. Plastering: we are experienced in dry lining, stud walls, plastering walls, ceilings and coving. Tiling: we can add additional tiling; completely re-tile walls and non specialist floor area spaces along with all aspects of grouting and sealing. 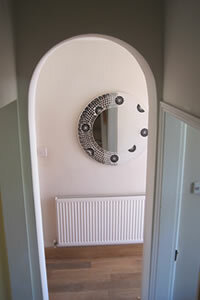 Painting: we undertake interior and small exterior painting and repair works. Light carpentry: we build book shelves and simple wooden storage cupboards / units into alcoves, fit skirting boards, architrave / moulding, erect stud walling, repair / assemble kitchen units. We are happy to discuss your carpentry requirements however big or small and see if we can help design / produce something that fits your needs.